After many experiments and 4 versions, I settled on my simplest design. The AD8307 splendidly responds to input signals from DC to ~ 500 MHz, so it can work well for a DC or ZIF receiver. However, any pulsing noise on its positive rail, or at the input may get converted to a DC output and wreck your log response and accuracy. Not to mention -- any detected RF will likewise wreck your day. Above all, I learned it's essential to put it in a metal box and filter the DC rail and input heavily. My analog meter registers a receiver input signal from - 121 dBm ( S1 ) to - 43 dBm ( S9 + 30 dB ) Note: measures made with a low noise + distortion continuous wave available power connected to the 50 Ω port of the filter / preamplifer with the receiver tuned to generate a 1 KHz AF tone at the receiver AF output. 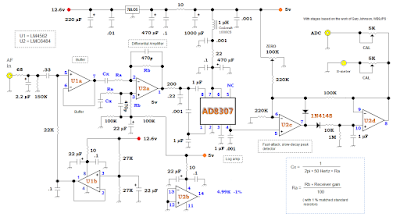 Above — Final schematic of my Jovian logarithmic amplifier module. I'll first discuss the DC filtration. 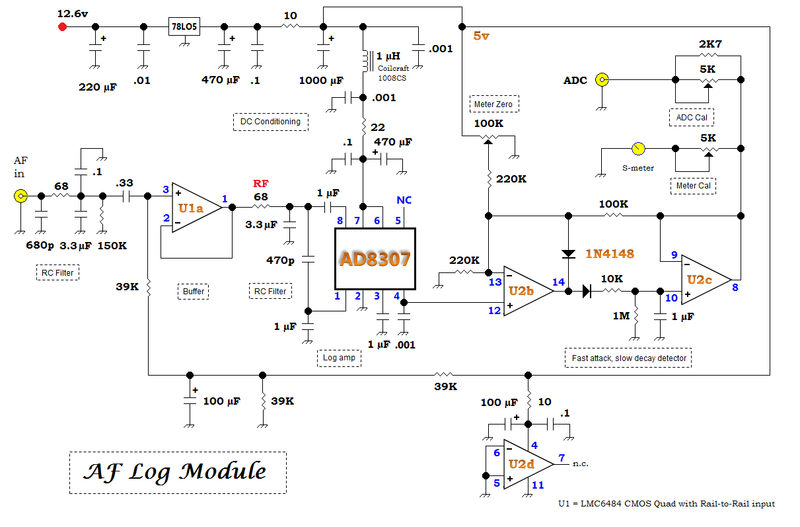 In past log amps featuring the AD8307, I ran battery power to eliminate any noise on the DC rail. In other versions, I added active ripple filters and for this project compared the results to just using big capacitors to filter the AF ripple. I measured no difference and opted for the 470 + 1000 + 470 µF shown. 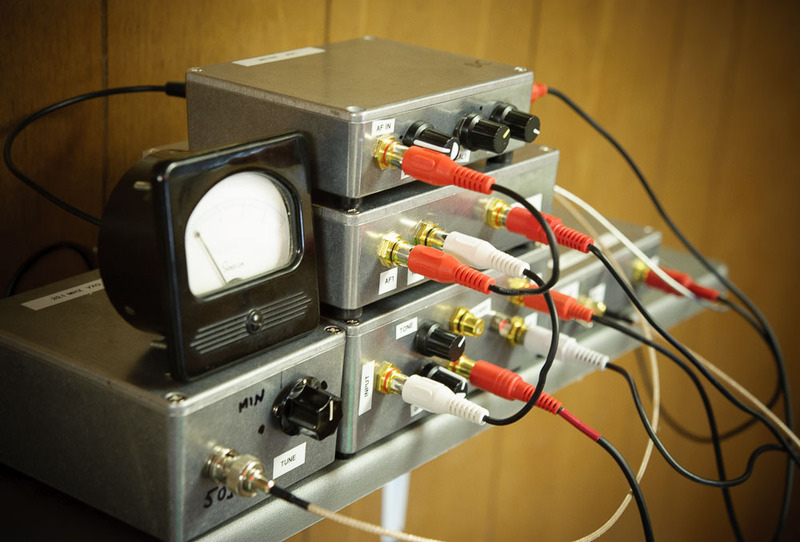 Further, careful RF filtration delivers reasonable attenuation of RF signals from HF to UHF. 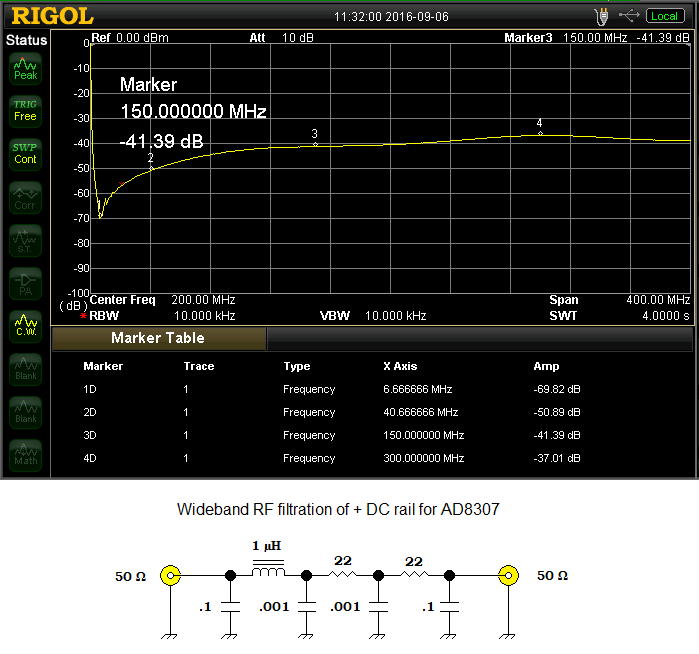 Above — Assessing my wide band RF filtration with a tracking generator + spectrum analyzer. My final network plied a 10 Ω resistor instead of the first 22 Ω resistor as shown above. 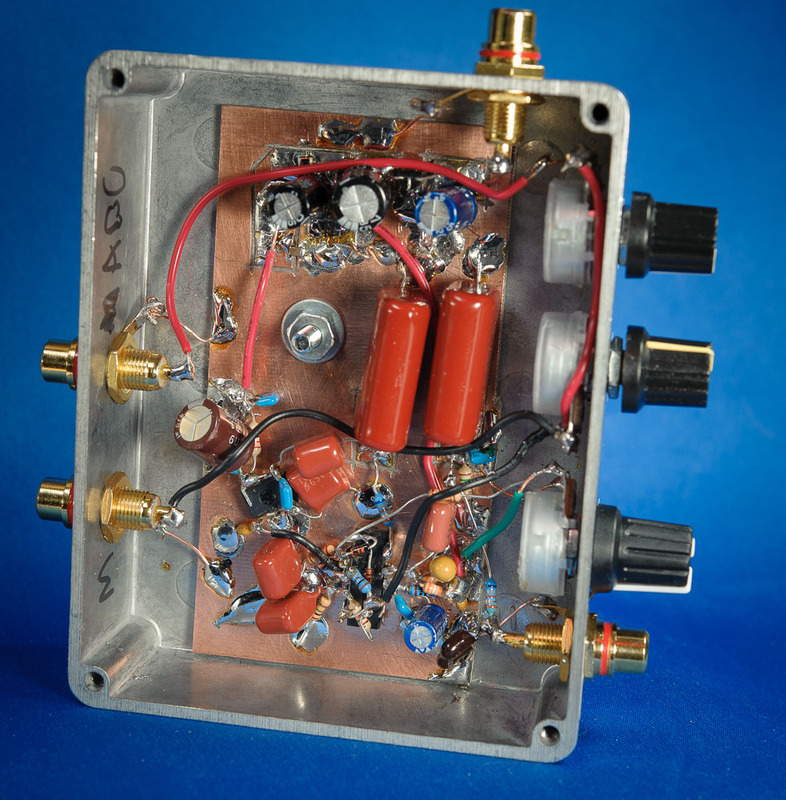 The reasonable Qul of the1 µH Coilcraft choke plus the 1n caps gives the added attenuation past 40 MHz. When combining RF capacitors in parallel with low Q Audio Frequency capacitors, no high impedance peaks occur, so it's OK to do this. Recall that when we combine 2 RF caps in parallel , the inductance of 1 capacitor resonates with the capacitance of the other to form a parallel resonance — leading to a high impedance — that wrecks RF bypass at a specific frequency, although this peak will also exhibit skirts like any band-pass filter. Hence, I've placed either a resistor, or a choke in between the shunt 1n or 100n RF capacitors. My inspiration came from Gary, NA6O ( ex-WB9JPS ) who penned An Accurate S-Meter for Direct Conversion Receivers for QST, February 2008. I recommend his article as a gold-standard reference on this topic. With Gary's permission, I copied his fast attack, slow delay post AD8307 detector circuitry, and the 5 volt supply rail-rail op-amp scheme. Further, Gary nailed the problems ailing the AD8307 at AF with particular insight. I ended up making 4 circuits and settled on the 1 presented above. This, an experimenters circuit, and likely requires your own nuance. Based on my AD8307 projects, much discussion and emails over the years, accurate log amps may prove thorny and difficult for some builders. Gary found common-mode noise afflicted his design when receiving small amplitude signals. 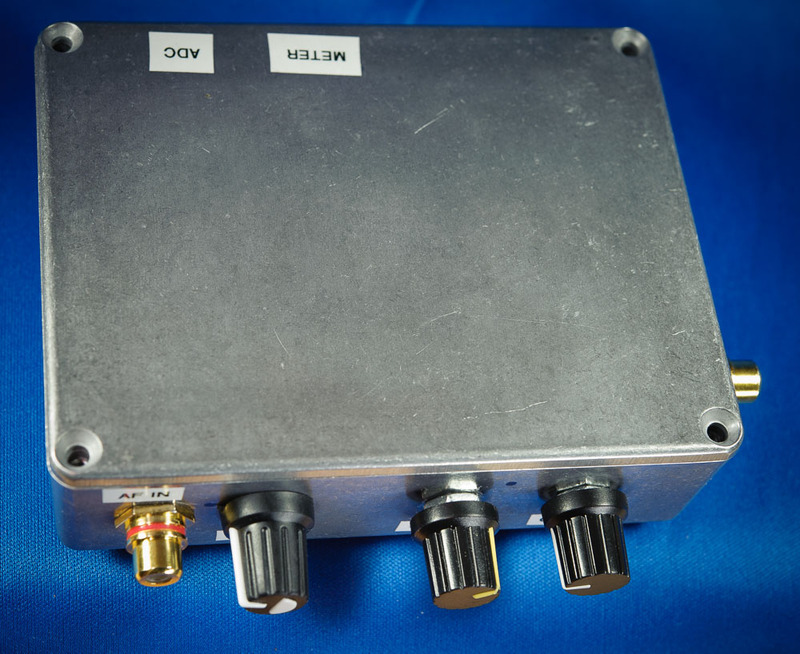 He opted for a front-end differential amplifier to reduce this noise while providing adjustable gain to optimize the AD8307 input amplitude to any direct conversion receiver with known gain to get the best possible dynamic range. I found his conclusion about needing variable gain true plus invaluable. Gain adjustment can be done in the receiver, or the log module; or both. Further, employing a low noise, rail-to-rail op-amp proved vital. Let's quickly review common mode noise in differential op-amps since sometimes when I discuss this, the other builder's eyes glaze over. 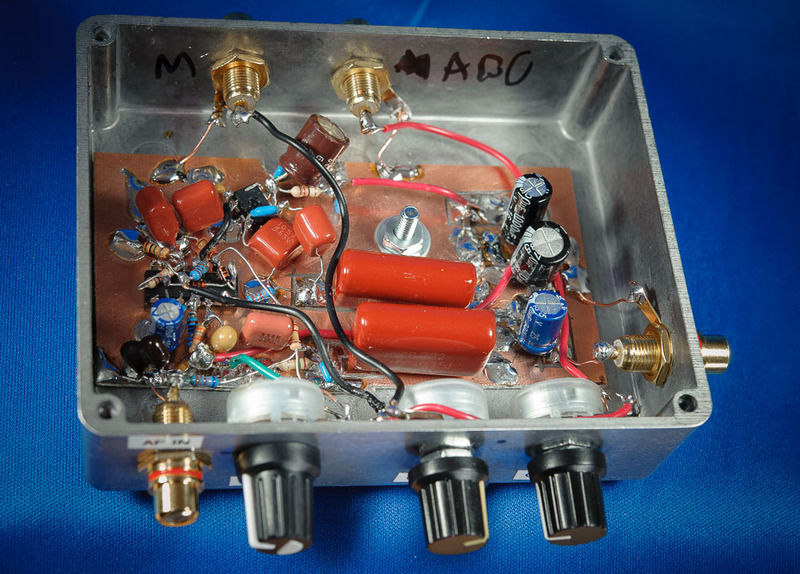 Differential amps done right reject common mode noise. In differential op-amps, the inverting [-] and non-inverting inputs [+] are driven 180 degrees out of phase. Since unwanted noise or hum appears in-phase on each input ( common mode ), this noise/hum gets rejected and does not appear at the op-amp output. Of course, you need to 1% match the input circuit capacitors and resistors to yield exemplary common mode suppression in an op-amp filter. 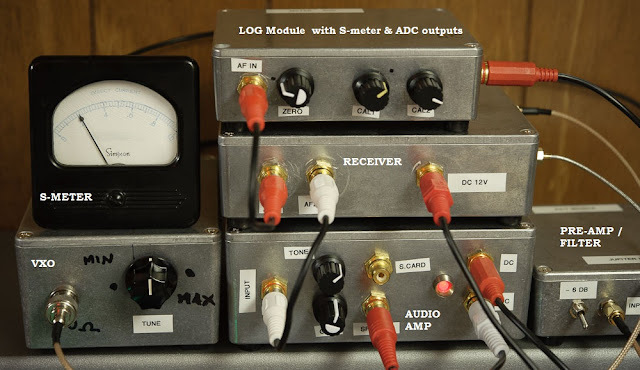 In my lab, with a differential amp/filter I obtained good results, but still, my AD8307 lacked sensitivity to measure signals when I applied < -110 dBm to the front end of my single-signal receiver. For my particular receiver, I found that brute-force R-C filters worked better. Simple R-C filters get a bad rap; likely because for a first order filter the roll off is only 6 dB per octave and we get so much better with our popular active filter designs. Let's trace the input of my circuit. A 680 pF cap connected to the front panel jack filters VHF signals -- especially around the FM broadcast band. From there a 68 Ω resistor plus a 3.3 µF provides a 3 dB down low-pass response @ ~ 709 KHz. A secondary filter gets formed with the 68 Ω resistor plus shunt 0.1 µF capacitor to filter any HF or LF signals getting into the input. The 0.33 µF series cap provides some hum immunity into the op-amp unity-gain buffer. An identical 68 Ω R ( labelled RF in the schematic ) plus a 3.3 µF polyester low-pass filters the buffer's output. If your receiver output looks pretty noisy, you may increase RF to as high as 200 Ω to drop that filter's 3 dB cutoff point. Brute force indeed. Set the buffer input and output R-C filter values to what you require. 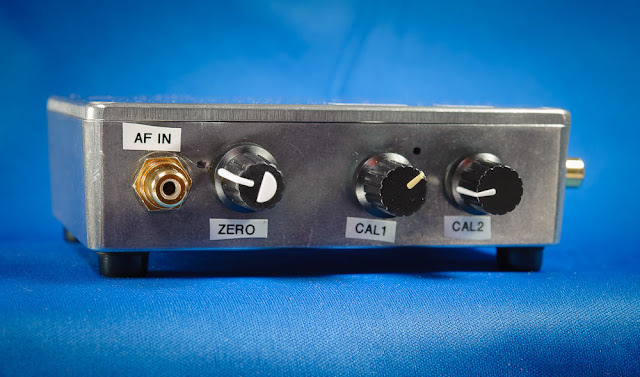 The two 709 KHz filters attenuate receiver AF wide band noise above 1 KHz that reduced the sensitivity of my log module to measure very low-level signals. With appropriate adjustment of my receiver output level pot and the meter's zero and calibration knobs, my analog meter reads 0 or nearly zero when the antenna ( or signal generator ) gets removed and replaced with a 50 Ω resistor terminator. Essentially, the log module nulls the receiver + AD8307 noise with no antenna input signal. receiver monitors low-level Gaussian noise for radio astronomy, I wanted the meter sensitivity focused towards the low end. Calibrating my analog S - meter proved easy. I set a calibrated signal generator to 20.190 MHz and tuned the receiver for a 1 KHz AF output signal. I injected - 73 dBm or S9 and adjusted the meter cal pot to go about 60% of my particular panel meter. Then I decreased power by 6 dBm to find S8 and so on. When satisfied, I had the range correct. I marked my meter with a black marker for S1- S9 -- and then S9 + 10 dB ( -63 dBm) , S9 + 20 dB and then S9 plus 30 dB. I tested the meter by inserting in-line 6 and/or 10 dB attenuators and so forth. 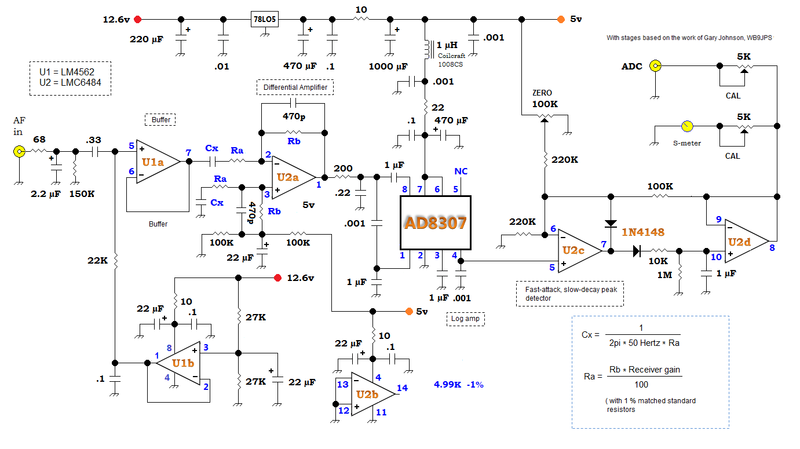 It check out and my meter marks account for any non linearity in the AD8307 circuit. This gives you a calibrated measurement receiver. I love the S-meter -- and Gary's fast-attack, slow delay detector further boosts the experience. With it, no AD8307 output DC low-pass circuitry is required ( see the datasheet ). The other output goes to a panel jack for a connection to the an ADC for data acquisition. The 2K7 shunted pot will help calibrate the noise power output on a graph. Above — First "real world" test with analog meter before I painted its face white and then after, marked the S units with a felt marker in a calibration set up. When I close the -6 dB switch on my preamplifier - filter module, the meter drops by 1 S-unit. I'm happy! I've attached 2 of my discarded circuits for experimental fodder. You have 100uF capacitor from U1A input to ground. I guess you missed a resistor there otherwise you have a capacitors voltage divider of 0.33uF to 100uF. Thanks for spotting this Victor. I flipped the 39K R in the voltage driver when I drafted the schematic. Now it's fixed. Many thanks again !! Its still has a problem. you need an additional 39K to make a 1:2 voltage divider for biasing the input of U1A. Now you have full 5V at U1A input.